Reflecting new technologies and the latest practices in the field, ELECTRICAL TRANSFORMERS AND ROTATING MACHINES, 3E delivers thorough coverage of theory and practical applications of electrical machines. It begins with a study of magnetism and magnetic induction, single-phase isolation transformers, current transformers, and autotransformers. A unit on three-phase power covers basic connections and calculations before proceeding into transformers. In addition, numerous experiments reinforce theory with hands-on application. 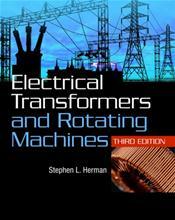 A unique combination of transformers and motors makes this book an excellent resource for electrical students and practitioners alike.